Welcome to my New Zealand, South Island page. Our fabulous 17 day trip left me with many photos, too numerous for me to include in my Blog Post which details the trip. Click here to read the blog post, or wait until you get to the bottom of the page and click on the link there. This small Township was our first overnight stop of the trip. We spent two nights in this area, based at the divine Walnut Block Cottages. We spent a couple of nights in this area. 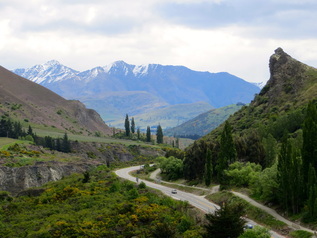 Beautiful scenery on the drive from Blenheim to Nelson. Great to explore the beautiful coastline of the National Park by boat, and a little bit on foot. Kershaw House Bed & Breakfast was great for our 2 nights here. This was a very scenic drive as it was quite rainy, this created many dramatic waterfalls along the sides of the road. We stopped to take a look at the amazing Punakaiki Rocks, or "Pancake Rocks". We also had an overnight stay at the Township of Fox Glacier. The next day dawned sunny and bright so we did a fantastic helicopter ride over the Glacier before carrying on our journey to Queenstown. What can I say, we had a fantastic 8 day stay in Queenstown. Very fortunate to be able to stay in the lap of luxury at Commonage Villas, some amazing Villas high up the hill, overlooking Queenstown. We visited the nearby townships of Arrowtown and Cromwell. Did wine tastings and took amazing drives around lakes and the surrounding countryside. A fabulous trip we did from Queenstown. Two hour drive to Manapouri where we picked up our cruising Catamaran for a sail down Doubtful Sound. We take a 6 hour drive back to Christchurch from Queenstown. Some amazing lakes and scenery along the way. In Christchurch, we witness the devastation of the two recent earthquakes which have dessimated the CBD area. We saw some innovative use of big shipping containers, shoring up damaged building facades and turned into cafes and shops, part of the Re: Start program. And finally, if you have 26 minutes to spare, check out the You Tube movie I put together which documents the trip. This includes some video footage of some of the amazing roads we drove along. Please feel free to send me a comment (note: it will not show up on this page).